Calling all gardeners! It’s fun, free and easy. Bring plants in one-quart, one-gallon or two-gallon containers to exchange for plants in like sizes. Please label all plants. Herb and vegetable seedlings may also be exchanged. Please check the website for plants that will not be accepted. For more information, call 732-671-6050. Tatum Park has 366 acres of rolling hills, open fields and bird-filled woods, as well as two Activity Centers, a playground and miles of scenic trails, for area residents to enjoy. The park is named for the Tatum family, who donated 73 acres of property to the county in 1973. Additional land was purchased with Federal Land and Water Conservation Funds and assistance from the New Jersey Conservation Foundation. Located off Holland Road, this site is used for sports and fitness classes and other public programs. Recently renovated, the stately mansion and its grounds are available for hosting wedding receptions. Our staff is available to assist you in planning a memorable occasion in this one-of-a-kind location. For more information, please click here or contact Park Manager Ken Olsen at 732-946-9562. Located off Red Hill Road, this building is often filled with the sound of voices. This center is a hub of activity for people of all ages and hosts numerous programs throughout the year. Near the Red Hill Activity Center, you'll find a playground at the edge of the woods. Youngsters can exercise and let off steam while parents watch them play in a natural setting. Picnic tables offer a relaxing place to lunch. 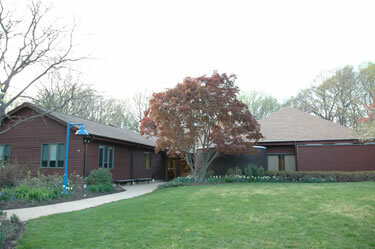 In 1981, a special wing funded by the Heath family of Middletown was built to honor Mary and Clinton Heath. In 1885, Clinton Heath, a freed slave from North Carolina, became the first black farmer to settle in Middletown. The wing features a permanent display of memorabilia from the county’s early black community. 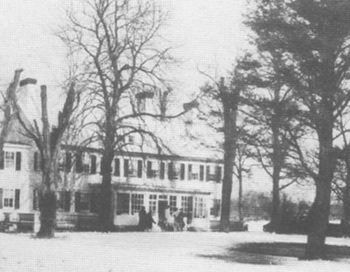 In 1905, glass manufacturer Charles Tatum of New York City purchased land in Middletown as a summer home for his family, close to factories in nearby Keyport and Millville. His company made laboratory glassware, bottles, decanters, paperweights and glass insulators. Some of these pieces are on display in the park’s Holland Activity Center, which used to be the family home. It was Tatum’s daughter-in-law Genevieve who donated a portion of the family’s property to the county. Garden State Parkway to Exit 114. Southbound, turn left onto Red Hill Rd. ; Northbound, turn right onto Red Hill Rd. Take Red Hill Road to right at light onto Dwight Road. 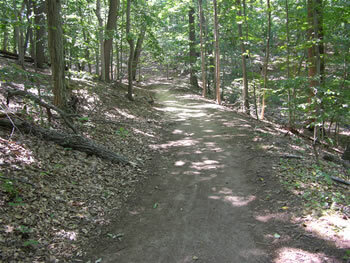 Dwight Road to left back onto Red Hill Road and follow Red Hill Road (1.5 miles) to Park entrance on left side. Southbound State Hwy 35 to Kings Hwy turn right. Follow Kings Hwy. to 1st traffic light (Red Hill Road). Turn right and follow up hill to Park entrance on right. Northbound State Hwy 35 to right at New Monmouth Road jughandle. New Monmouth Road and cross back over Hwy 35 to stop sign. Right at stop sign onto Kings Highway to 1st traffic light (Red Hill Road). Turn left and follow up hill to Park entrance on right. Garden State Parkway to Exit 114. Southbound, turn left onto Red Hill Road. ; northbound, turn right onto Red Hill Road. Follow Red Hill Road thru light and name changes to Van Schoick Road. Follow Van Schoick Rd. to Holland Rd., turn right. Follow to Park on right. State Hwy. 35 to South Laurel Ave. Southbound, turn right; northbound, use jughandle to make left turn. Follow South Laurel Ave. To Holland Rd., turn left. Follow to Park on right.